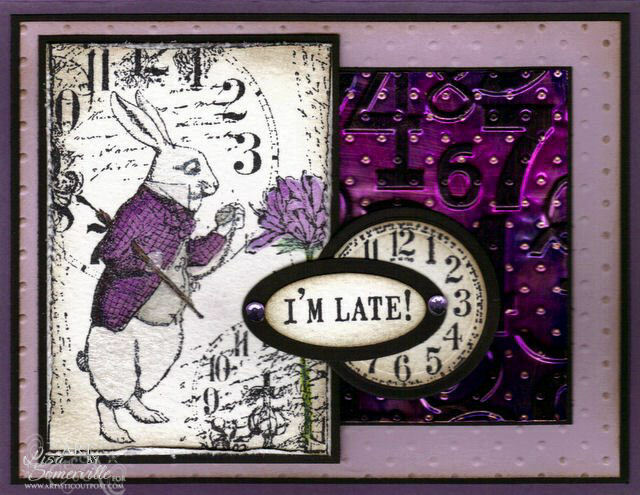 Designs by Lisa Somerville: I'm Late for a Very Important Date! LOVE this Lisa! I always loved that character in the story and think this whole set is fab! Love the way you've coloured it in, it looks lovely done monochromatic. I need to put something like that on my wall, I'm always running late, trying to work on it! Oh, I just luv it! Color is great! I love it!! That image is darling and I just love your layout and the rich purple! I love this image also! Beautiful backgrounds and of course your coloring and choice of colors is fabulous! Wow, what a cool card. Love the colours. beautiful!! great choices of colors! What a fun card, love the purple! I love this! Being an Alice In Wonderland fan ...well, it's gorgeous! Stunning card! I love the gorgeous purple too! Wow! I love that technique, that looks so cool! Fantastic monochromatic card. Great job--wonderful color. Been playing with this one myself--cute set! This is fantastic! The colors, design and that Rabbit! Fabulous.